One of the greatest natural monuments is the Samaria Gorge, which is located among the White Mountains in the western part of Crete. The Samaria Gorge is 16 km long and starts by the Omalos Plateau at a height of 1250 m and falls into the Libyan Sea at Agia Roumeli. The first three kilometres go straight down, and from then on, it is a wild ride following the dried-up river with its rich vegetation and animal life. The trail is clearly marked and in good condition. There are also guides along the route, who are there to help if any problems should arise. It is possible to refill your water bottles and there are toilets several places along the trail, but you cannot buy food on your way through the national park. 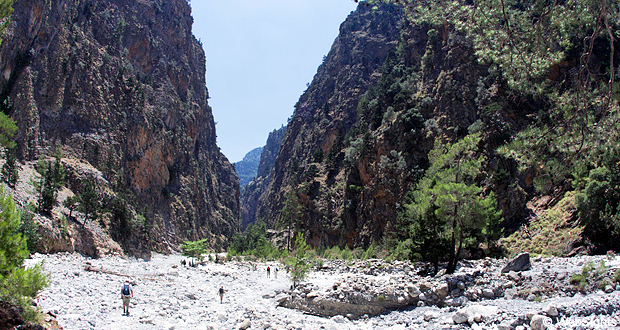 Almost half-way through the Samaria Gorge, you will reach the deserted village of Samaria. The villagers were resettled in 1962, when the gorge was made a national park. 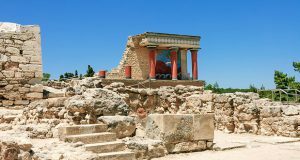 The houses are still there, but the only ‘inhabitants’ now are a doctor (during the daytime) and the wild Cretan goats, Kri-Kri, that sometimes go near the village. The village of Samaria is the perfect place for a rest and a lunch break. There are also toilets in the village. After a hike of almost 13 kilometres in the most breathtaking surroundings, you will reach one of the highlights, the Iron Gate. This is the most narrow place on the trail and the sides soar straight up to a height of 300 metres and a width of only three metres – it is incredibly beautiful and fascinating at the same time. The national park ends at the Iron Gate, but there are still three kilometres to the coast of the Libyan Sea in the town of Agia Roumeli. Here you can stay at one of the many hotels in the town, but most people continue with the ferry to the bus pick-up point, typically Sougia or Hora Sfakion. Depending on your shape and trekking experience, the entire hiking trip from the Omalos Plateau to Agia Roumeli takes between 3 and 7 hours. Remember to wear good hiking shoes!